I know its been about a month since I have posted but my family and I took awhile to recover from the holidays…. 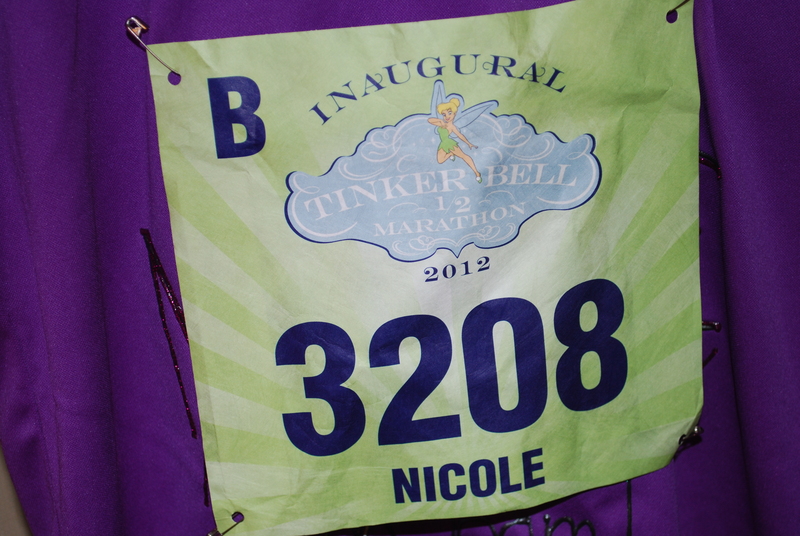 I’m back with a 2 part pre- and post- Disney race blog(s)! My half marathon with team in training was this past weekend and I thought I’d go over how to prep your ‘runner’. This is basically taking everything that you may need for your race and laying it out so that you don’t forget anything for the day of your run. Runners are very superstitious so you will commonly find them doing the same routine from what they eat before, during, and after to what they wear to be consistent from race to race. I am no exception because I want my race experience to be as enjoyable as my best run on the streets. 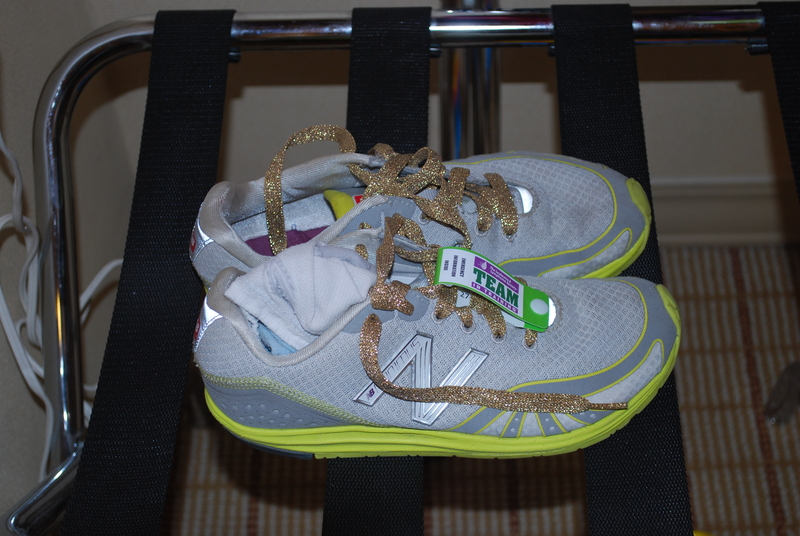 Next up is what to wear… Starting with my feet, I’ll be wearing a trusty pair of socks that I have already trained many runs in as well as my New Balance running shoes and spiffy gold sparkly laces. Next, I’ll wear my running capri’s, which have a little compartment in the rear to hide 1 gel for about mile 6 (the other gel I plan to consume, they are offering on the course around mile 9). 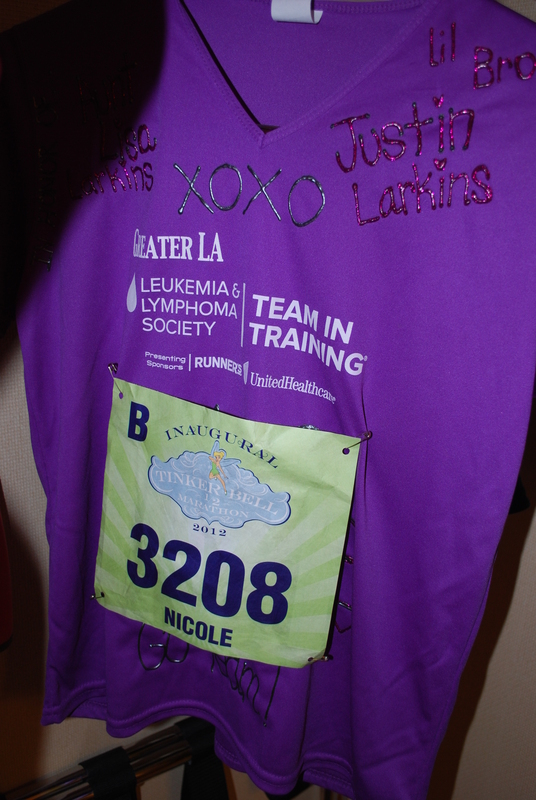 Next is my running bra and Team in Training Jersey which I decorated with puffy paint. This was so much fun to decorate, I could have done so much more but I think I already went a little overboard (hehe). 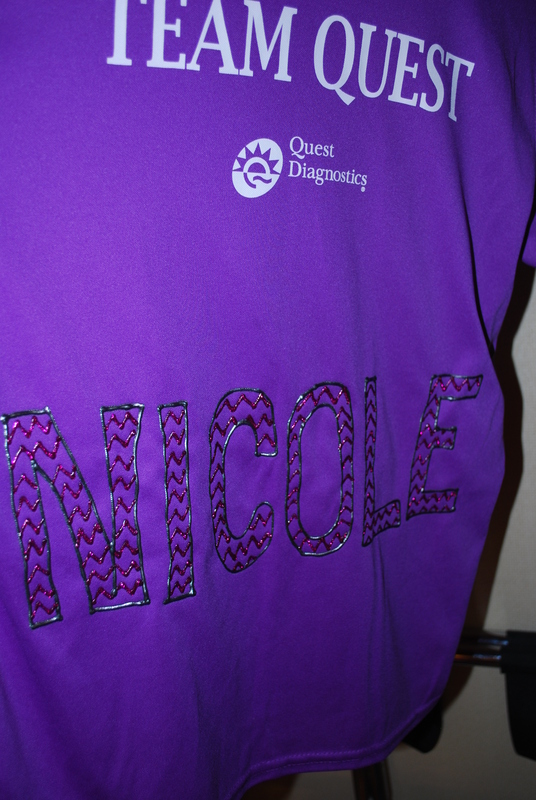 I included my name on both the front and back because as you are running spectators will see your name and cheer you on along the sidelines. This is extremely motivating especially about mile 12 when you are just ready to give in! I also included 2 honorees of Leukemia and Lymphoma. The first being my little brother Justin, which I wrote about a few posts ago, the second being my Aunt Lisa who survived Lymphoma. The next part of my outfit is my hat for when the sun does come out. Finally, I have a pair of cotton gloves and a jacket that I recently purchased at the goodwill which I plan to wear before the race and for the first couple of miles before I warm up and then I will throw them to the side. The race will then donate my clothing items that I throw to the side to the goodwill or homeless shelter for someone else to wear since I only wore them for that brief period of time. Last but certainly not least, I’ll be carrying my cell phone so I can take pictures and also so that I can find my family once I get to the finish line. 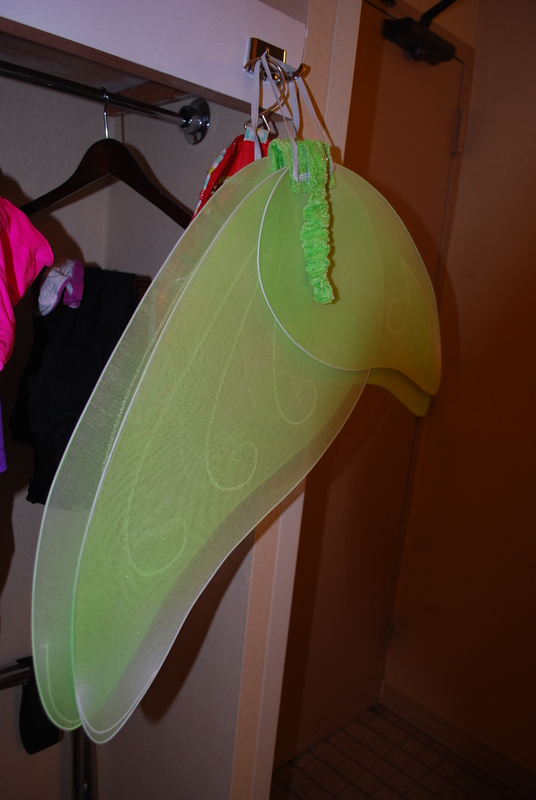 Once I laid everything out, I packed it all away in my suitcase for the weekend so I wouldn’t forget anything. Building your runner is a great thing to keep in mind when you are planning for your next race so that you don’t forget anything while you are on the road. I’ve got to remember this post if I ever decide to run a half marathon…great tips! I love the part of giving the jacket back to goodwill, that’s really cool! Fun post!